Featherlite is the oldest aluminum specialty trailer manufacture in America and one of very few companies in the industry that builds its trailers and interiors within the same facility. The Featherlite approach gives you matchless quality control and single source customer service. Featherlite trailer owners can select from eight distinctive living quarters color packages, or choose from hundreds of interiors options or custom design one to your individual taste. Distinctive interiors are available in many lengths from Featherlite’s weekender package to a large custom designed 40-foot trailer. 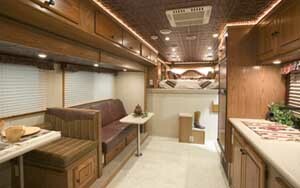 Featherlite side-outs provide you with dramatically larger interiors. You choose the living space that works best for your lifestyle.